Preheat oven to 375°F. Brown ground beef and onions then drain. Mix beef, onions, and cream of celery soup and place in the bottom of a 13x9 casserole pan. Spread cheddar cheese evenly over meat mixture. Arrange tater tots over cheese to cover cheese and meat mixture. 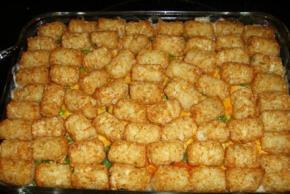 Place casserole in oven and bake 30-35 minutes or until tater tots are golden brown.